In about a month a big marketing push has to ensure the rapid adoption of the platform. Zeebox and its partners will launch a “marketing campaign in mid October during which every single network will be running commercials, Comcast will be running on 30+ networks and all NBCU digital sites will promote Zeebox” says Page Thompson, Executive Vice President of Strategic Integration for NBCUniversal. With more people using mobile devices while watching TV the competition for the distracted eyeballs is fierce. Apps are trying to find the sweet spot to enhance the TV experience without interrupting or becoming irrelevant. 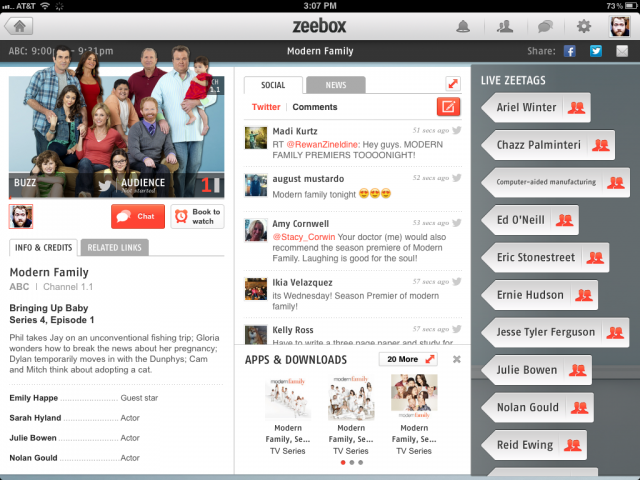 The launch of Zeebox can have a big impact on the seconds screen, social statistics and advertising industry in the US. The next Second Screen: Powered by Zeebox? 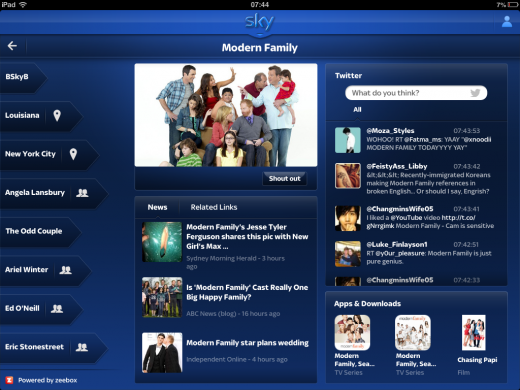 A couple of days before Zeebox launched in the US, Sky+ in the UK introduced a new branded iPad application that is based on Zeebox’s second screen technology. The updated app introduces an enhanced experience for Sky+ viewers by not only showing the TV guide and allowing users to control their TV, but also providing the option to learn more about the shows in their TV guides by connecting to Zeebox’s platform to deliver that data. This Sky+ app is the first example of a ‘white label’ Zeebox application branded by the channel offering the app but supported by the Zeebox platform. Anthony Rose, Co-Founder and CTO at Zeebox, notes it would be crazy for consumers to download a new app for every channel and in the U.S. at least, a lot of broadcasters have concluded that building an app for a programme or even a channel is not sustainable. He thinks zeebox, which is an open apps development platform using HTML5, is the answer. By getting the name Zeebox across in the US using the @Zeebox Twitter account (They use @zeeboxUK in the UK), a fresh Facebook page and (traditional but Zeebox enhanced) TV ads, the company is chasing a a single-app model that has to cover all channels, service providers, producers, networks, and TV shows. “What the industry really needs is a nationwide platform,” says Sam Schwartz, president of Comcast’s converged products division. By providing both the Zeebox app experience and the Zeebox platform and technology as white label solution the company tries to be the one Second Screen to rule them all. 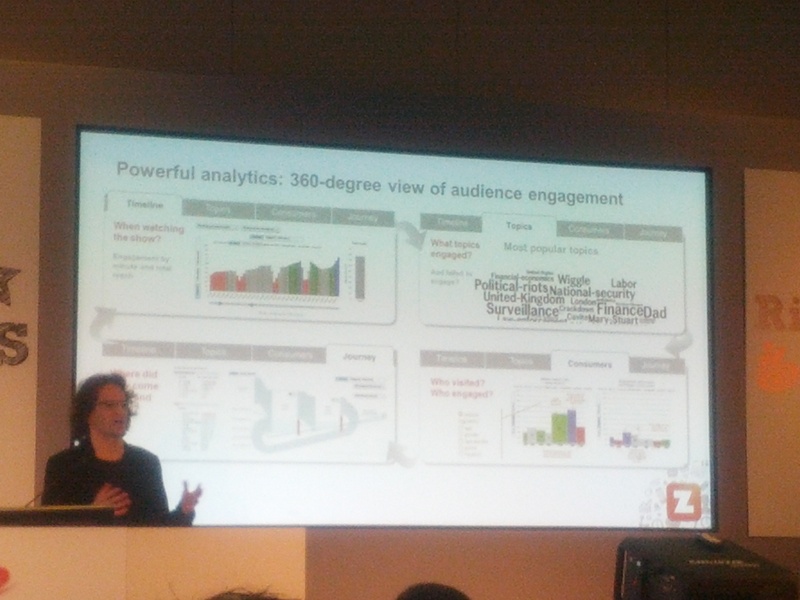 During a session at IBC 2012 in Amsterdam Anthony Rose, CTO and co-founder of Zeebox, gave a presentation providing insights in the ‘next steps’ for Zeebox. During this session he showed a number of slides showing the Social TV statistics interface that Zeebox can create by gathering Social TV data from social media like Twitter and Facebook and the users of the Zeebox app. This data provides a unique offering for cable companies, TV channels, producers, advertisers and marketing agencies by giving more detailed insight in TV viewing behavior. The advantage that Zeebox has over established Social TV metric companies like Bluefin Labs and Trendrr is its ability to connect the massive amount of data to individual users and profiles and knowing if they are actually watching the program. As a result the data provides more detailed and complete viewer profiles giving Zeebox a big advantage over Bluefin Labs and Trendrr (and even Nielsen) by being able to directly connect Social TV metrics with TV viewing behavior. 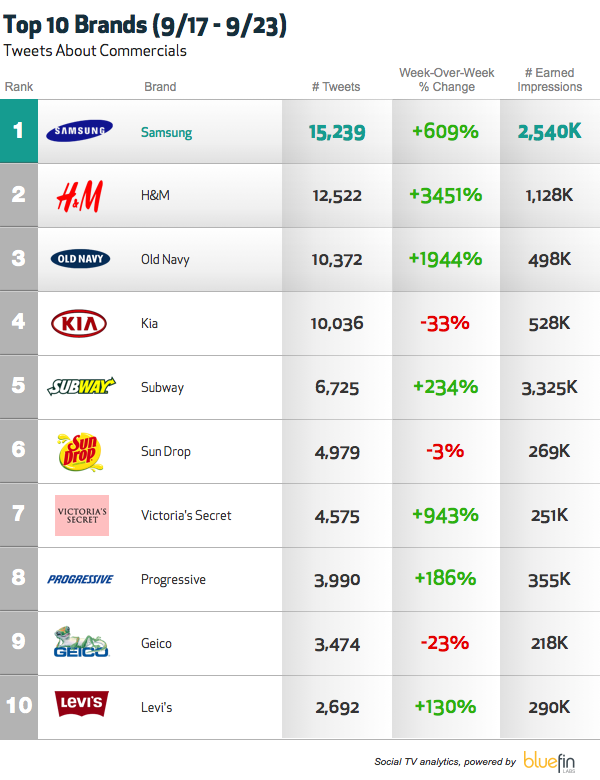 Below is an overview created by Bluefin Labs showing the most discussed Social TV ads on Twitter. 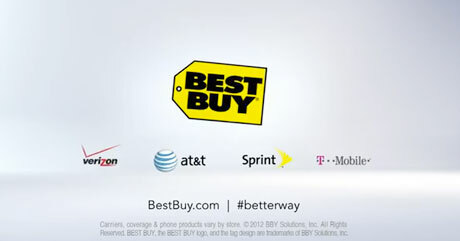 Ever since the #Superbowl2012 companies are increasingly showing a Facebook URL’s or Twitter hashtags instead of a corporate website to directly interact with viewers and creating social buzz around their brand (for example in this Best Buy ad). With the growth of social buzz on Twitter and Facebook around TV advertisements new opportunities arise using second screen apps, ad recognition using Automatic Content Recognition (ACR) technology like fingerprinting or watermarking, and HbbTV technology in Europe. Our Advertising may be contextual, that is related to your location, your use of the App over time, your shared TV viewing as disclosed by your use of zeebox, or based on other information you have provided to zeebox or has been provided to us by third parties or is ascertainable from your user profile. Some pilots have aired in the UK showing overlay ads within the Zeebox app after clicking a sponsored ‘zeetag’. When you click the zeetag an overlay displays shows content directly from the advertisers website providing ‘click to buy’ or ‘read more’ calls to action. As Anthony Rose describes Zeebox advertising opporunities; “this is the beginning of a journey for us. It’s not hard to foresee how this will evolve, including connecting our second-by-second knowledge of the exact ad on TV now, what’s been said before and after it, the programme it’s on, and the user’s profile, to a range of contextual advertising opportunities, some created by us (as we do already with our links to the iTunes store) and some offered for sale”, showing the power of the Zeebox platform to combine contextual profiled advertising with TV ads. “The particularly fascinating part of this last sentence was the “second-by-second knowledge of the exact ad on TV now, what’s been said before and after it” in that zeebox can give advertisers an absolutely minute understanding of how effective their messages are to the audience. This can reap great rewards” according to Kauser Kanji after interviewing Anthony Rose. One Second Screen to Rule Them All? Your mom! 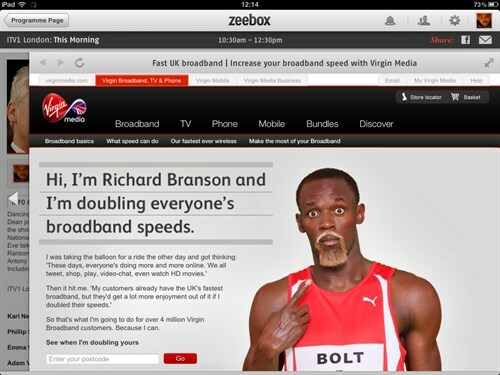 But will Zeebox be the one platform that will rule them all? I must admit that their combination of social interaction, TV guide information, content recognition and interactive elements is the best I’ve seen so far in one app. But is this because other apps don’t have Zeebox’s first mover advantage, great team of developers and investments from mayor cable operators? Or do these apps focus on a niche market like recommendation engines (Tweek,Dijit), check-in services (Miso, GetGlue) or show specific community and commerce apps (Sons of Anarchy app)? In the end it’s the traditional TV viewer that has to adopt these apps to become profitable and reach a critical mass. Social TV and the second screen has to be adopted beyond early adopters or has to wait for the ‘next generation’ or ‘cord-nevers’. Before that it’s just technological innovation trying to disrupt a complex established market. 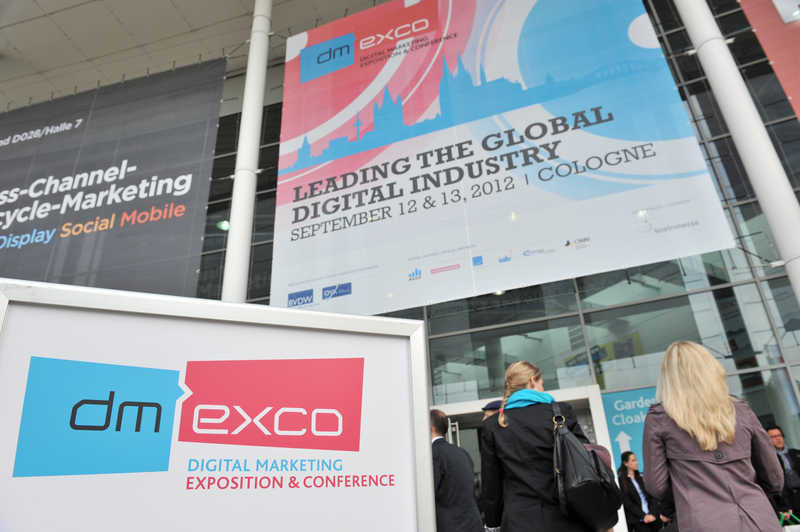 Mike Dacy of Sky Television from the UK said it best during IBC 2012 “consumers don’t change too much, they’re still lazy. It’s the technology that is changing, not the customer”. My point of measurement: Whatever app my mom uses first wins.